I get to see this on a regular basis where I live near the St. John's River in Florida. The site of the slaughter is called "Matanzas", Spanish for "massacre". There's even a Matanzas High School near the site of the massacre. May the courage of those who were slaughtered for their faith in Jesus Christ encourage us today! The Huguenots were converted out of Catholic France when preachers brought Bibles and the Calvinist doctrines of predestination and justification by faith from Switzerland. Growth of this Reform church was rapid in Gallic lands. Within a hundred years it had won a million and a half converts. Some French leaders saw in the emergence of this sect a chance to catapult themselves to power. Unfortunately, this led to a succession of wars in which the Huguenots, fighting against overwhelming odds, won enough victories to force concessions from Catholic France, but never took the throne. One of these concessions was the Edict of Nantes. Gradually it was gnawed away by government officials and overzealous prelates. 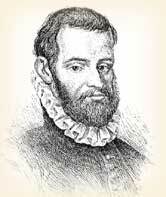 Consequently many Huguenots began to migrate overseas, hoping to improve their lot. Of all the Christian sects which emerged from the Reformation, the Anabaptists and Huguenots suffered the most. The atrocities committed against both have filled books. 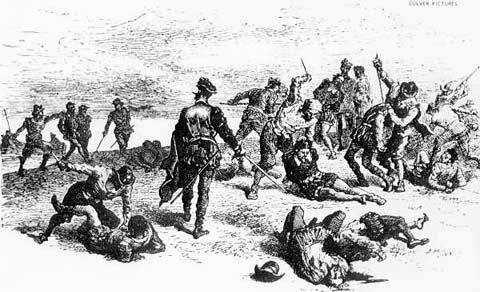 One of the bloodiest and most senseless acts of butchery against the Huguenots occurred in Florida on this day September 20, 1565. Colonies of Huguenots had struggled to establish themselves in Florida for several years. The Huguenots at St. Johns expected trouble when Spanish captain Pedro Menéndez sailed into the area. Spain, after all, claimed the New World and had no use for the French and especially French Protestants. One leader of the Huguenots, Laudonnière, wanted to throw up a fort. He was overruled by Ribault, commander of the whole expedition. Ribault had determined on a naval battle (he had seven ships). Unfortunately Ribault's ships were wrecked in a storm and the unhappy Huguenot refugees on shore were left to fend for themselves. Menéndez landed with 2,600 men. He butchered all the men he could lay hands on but spared women and children. Laudonnière fled with a few men in a small remaining boat and eventually reached France. Ribault and those who had escaped the shipwreck, about 350 in all, asked for terms of surrender. Menendez said they must trust themselves to his mercy. It appears he swore an oath to spare them. Two hundred who distrusted him fled into the wilderness. The rest surrendered. Ribault reminded Menéndez that Spain and France were at peace. That mattered little to the cruel Spaniard. Menéndez wrote the king: "I had their hands tied behind their backs and themselves put to the sword. It appeared to me that by thus chastising them, God our Lord and your Majesty were served. Whereby this evil sect will in future leave us more free to plant the gospel in these parts." When the matter became known in Europe there was a tremendous outcry from all decent men, Catholic and Protestant alike. The remaining 200 Huguenots put up such fierce resistance that they were finally promised their lives if they surrendered. They were consigned to the Spanish galleys. Avery, Elroy McKendree. History of the United States and its People. Cleveland: Burrows Bros, 1904. Fosdick, Lucian J. The French Blood in America. New York: F. H. Revell company, 1906. Woodburn, James Albert and Moran, Thomas Francis. Introduction to American History. New York: Longmans, Green and Co., 1916. Source of the Image.